Health advocates urging the LGBT community to enroll in health care coverage before the January 15th deadline held a press conference Tuesday morning at Howard Brown Health to emphasize the importance. “We are off to a very strong start to Open Enrollment. We are seeing record demand for this quality, affordable health coverage,” said US Dept. of Health and Human Services Region 5 Director Kathleen Falk. “But we know there are many more still without coverage, including many in the LGBT community.” According to Falk, approximately eight million people signed up for covered by December 19th. Around 2.4 million were new Marketplace customers. According to the 2013 National Health Interview Survey, which included measures on sexual orientation, the uninsured rate among lesbian, gay, or bisexual adults aged 18-64 at that time was comparable to that of the heterosexual population (19.0 percent versus 20.1 percent, respectively). However, for LGBT adults with incomes below 400 percent of the Federal Poverty Level or $45,960 a year, one in three (34 percent) were uninsured in 2013, compared to 27 percent in the general population, and they were less likely to have employee-sponsored insurance. At the press conference Congressman Mike Quigley addressed the crowd. Residents can enroll at GetCoveredIllinois.gov or at the upcoming events listed below where trained professionals will be offering free and confidential assistance. Open enrollment for 2016 coverage runs from November 1, 2015 to January 31, 2016. For more information or to find a local assister, please visit GetCoveredIllinois.gov or call 866-311-1119. Howard Brown Health offers free, in-person help with its Insurance Enrollment Assisters Program. 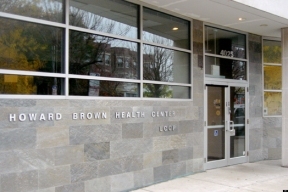 Meet with an Insurance Enrollment Assister at Howard Brown Sheridan at 4025 N. Sheridan Monday – Friday. Call 773-388-8683 to schedule an appointment. See howardbrown.org for more information.